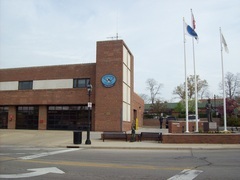 In recognition of Fire Safety Week, the Glen Ellyn Fire Department will play host to a fire safety open house at the downtown fire station. The station is located at the corner of Main Street and Pennsylvania Avenue. The open house will take place from 10AM – 1PM on Saturday, October 8th. Additional fire safety open houses will take place on Monday night from 7PM-9PM at the downtown fire station and at the Taft Avenue fire station. All are welcome to attend.